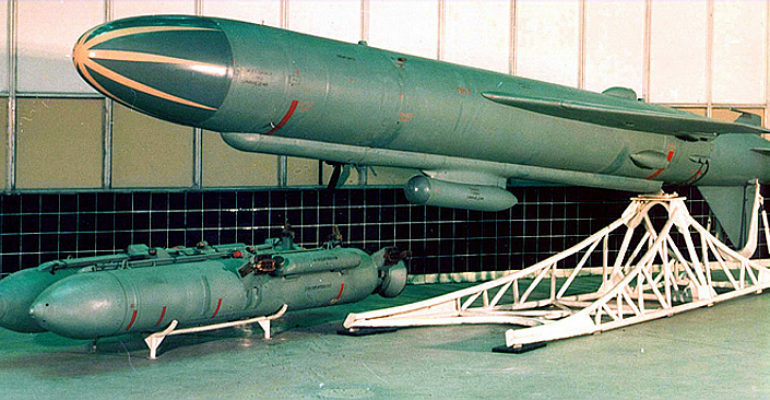 Based on the P-70 Ametist, the P-120 Malakhit (SS-N-9 Siren) is a medium-range anti-ship cruise missile designed by the Soviets in the late 1960’s to enable the Charlie II class submarine to fire without surfacing. The P-120 was originally designed for VLS submarine launch, but was retrofitted for surface launch from Nanuchka and Tarantul class corvettes. It was first employed in 1972 on Project 1234 Nanuchka I class corvettes. The cruise missile begins its flight by climbing to an altitude reported between 100-200m and using an inertial navigational seeker to identify targets. The missile uses a solid-fuel booster to achieve altitude and then transitions to a turbojet engine to each cruising speeds of up to Mach 0.9. The active radar seeker allows the P-120 Malakhit to hit targets without guidance from the launch point, and the IR seeker, located in a ventral pod, acts as a backup guidance system resistant to jamming. At approximately 10km from the target, The P-120 drops to between 40-60m and delivers a powerful conventional 500kg payload. The P-120 is also capable of delivering a 200kT nuclear warhead. The Russian navy has decommissioned all Charlie II class submarines, but the P-120 Malakhit is still equipped on Nanuchka and Tarantul class corvettes. Two P-120 Malakhit cruise missiles destroyed a Georgian patrol boat in the 2008 conflict. The IR seeker contingency allows the missile to avoid radio-electronic countermeasures and find targets even if the launch ship has been compromised. The relatively short range of the P-120 makes it ineffective against more advanced navies. Although still in use by the Russian navy, production of the P-120 Malakhit has ceased in favor of the newer P-270 Moskit missile (NATO designation S-N-22 Sunburn), which has a longer range and more advanced features.